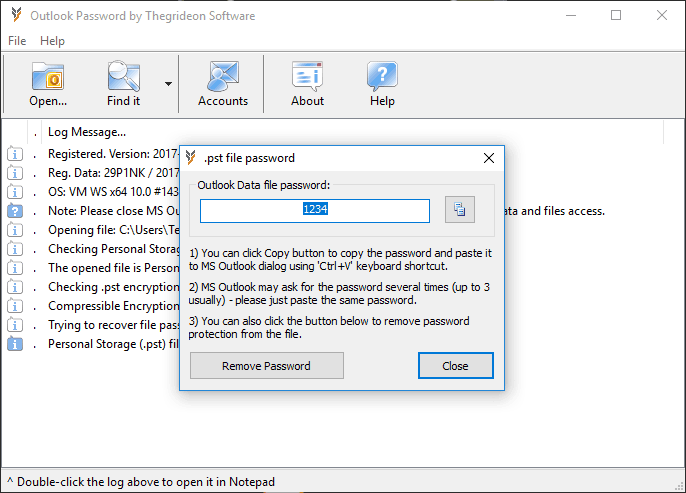 Outlook Password by Thegrideon Software is an advanced tool for MS Outlook password recovery. It allows you to recover or remove Outlook '.pst' files passwords in seconds. 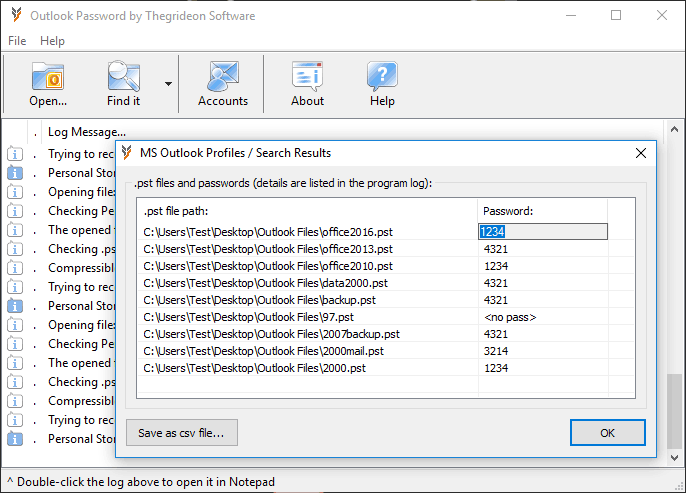 Outlook Password also recovers saved email accounts details (logins, passwords, server settings) from current MS Outlook records. You may also check OST & PST Forensics for detailed '.pst' analysis and data recovery. Password can be removed from protected '.pst' file as well. All encryption methods are supported. Large (4Gb+) '.pst' data files are supported. 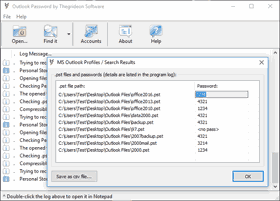 Outlook Profiles and '.pst' files search and mass processing. Recovers email logins, passwords and settings saved in MS Outlook. No additional external libraries or frameworks to install. All MS Outlook versions are supported: 97 - 2019. Windows XP - Windows 10. Personal Storage files, also called Personal Folders (Outlook Data files in the latest versions) are the storage for all or a part of your Outlook data: e-mails, contacts, calendar records, etc. Outlook Data files can be password protected as well as encrypted. These files can be associated with Outlook Profiles and in such a case your pst file password is your Outlook profile password as well. Whatever the password length, file size or Outlook version (encryption method), Outlook Password allows you to recover pst file password or remove it. Profiles search and .pst files search and mass processing are available as well. Short Outlook Password video demo. Password recovery for any valid '.pst' file is guaranteed - in the unlikely case of any issues we will remove or replace your file password for you. Trial version allows you to check passwords recoverability. Recovered passwords are hidden behind the asterisks. Password removal can be tested on files protected with passwords "trial" or "TRIAL".